Here's a masculine gift bag that I made for my dad's birthday present. I bought the big kraft gift bag at Michael's for $1 (with my coupon). To decorate it, I made a banner using My Creative Time's Build a Banner Kit. I love playing with this kit. It's so fun and easy. It comes with 4 dies: the little stitched circle, the "sun" shape, and 2 different pennant shapes. 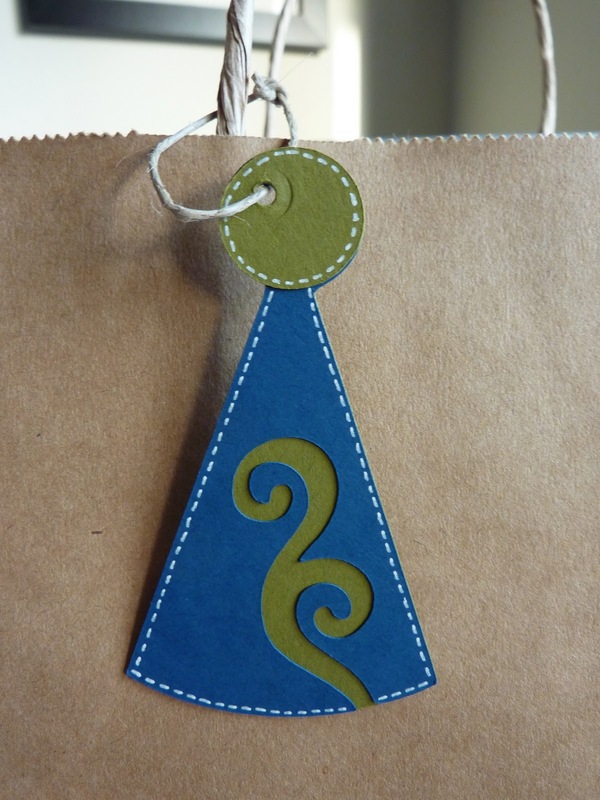 I die cut the "sun" shapes using blue and green cardstock. I used cream cardstock for the stitched circles and the pennants. 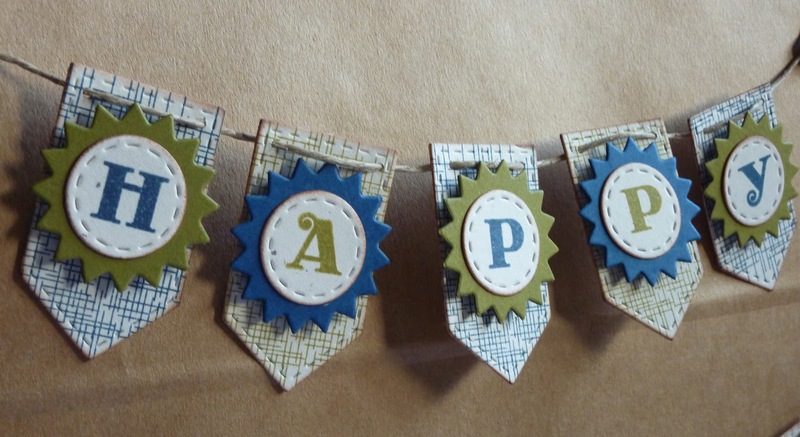 The pennants are stamped with the burlap stamp included in the kit. The letters on the stitched circles are from another My Creative Time stamp set, Anyday Bingo & Crossword. The letters are a perfect fit for the banners! After my banner pieces were assembled, I punched holes in their corners and strung them with some twine. To attach them to the gift bag, I just wrapped them around some brads. 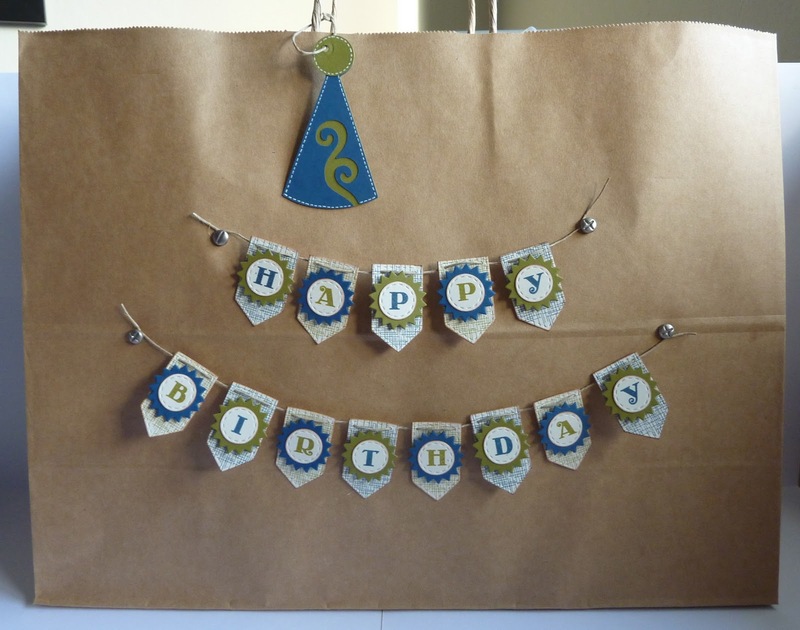 This way, the banner can be taken off of the gift bag and used again for another purpose (decoration, for a scrapbook page, etc.). The party hat tag was cut at 3 1/2" from the Cricut American Alphabet cartridge, which is one of the built in cartridges on the E2. I gave it some white stitching and then punched a hole at the top for some twine. I totally forgot to use my Crop-a-dile, and ended up mauling my tag with a regular hole punch. Luckily, dads don't notice these things. Love how this turned out Katie. Definitely a great masculine gift bag. I so need to get this set from Miss Emma...you definitely know how to show off her stamps. Awsome, great idea, love it!!! katie, I LOVE this, the screw brads are the perfect touch! This is so cute, and yet masculine! Thanks for the inspiration, I'm always looking for masculine projects. Wow, never thought to do that! 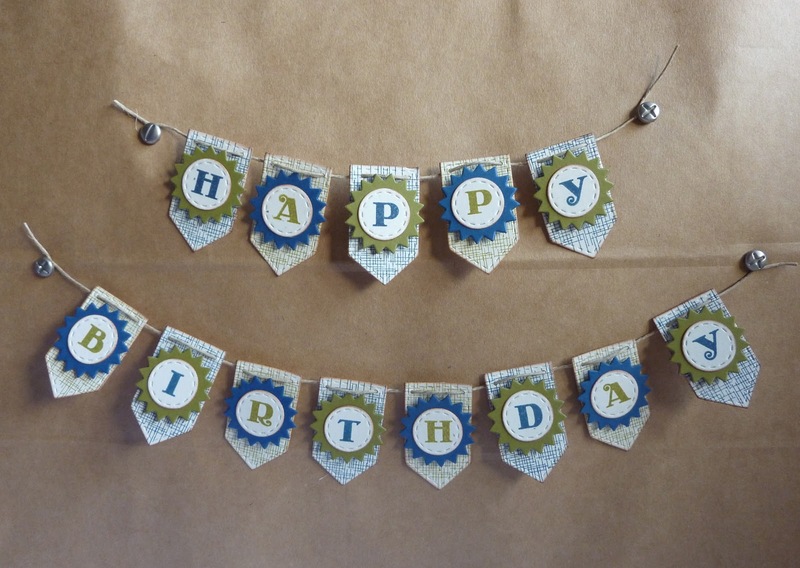 What a fun way to use a banner! Very creative and really cool banner, too! This is ADORABLE!! You are so dang creative!! LOVE your style~!!! I SOOOO need to do this to my "Manly" gift bags!!! It is PERFECT!